Honey, a natural sweetener is the only added sweetener. Roasting brings out the true flavor of the apples. Wash and dry the apples, cut into quarters and remove the cores. Add the honey and cinnamon and gently mix with a fork. You can use a variety of apples to make applesauce but some of my favorites are Northern Spy, Pippin, Granny Smith, Pink Lady, Gravenstein, McIntosh, Elstar, Cortland, Fuji, Gala, & Gravenstein. When I make my sauce I like to mix it up and will roast 9 to 12 apples at a time, choosing 3 each of whatever different varieties look best. 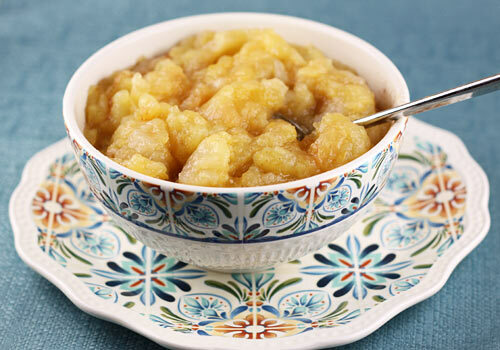 This way, as you savour your applesauce you can get a little sweet or tangy flavor in each spoonful.